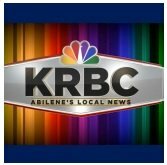 News TV Channel / KRBC-TV, virtual channel 9 (UHF digital channel 29), is a NBC-affiliated television station located in Abilene, Texas, United States. Owned by Mission Broadcasting, the station is operated by Nexstar Media Group through a shared services agreement as part of a virtual duopoly with CBS affiliate KTAB-TV (channel 32). The two stations share studio facilities located on South 14th Street in western Abilene. Also, the stations share transmitter facilities located on Texas State Highway 36, in neighboring Callahan County.